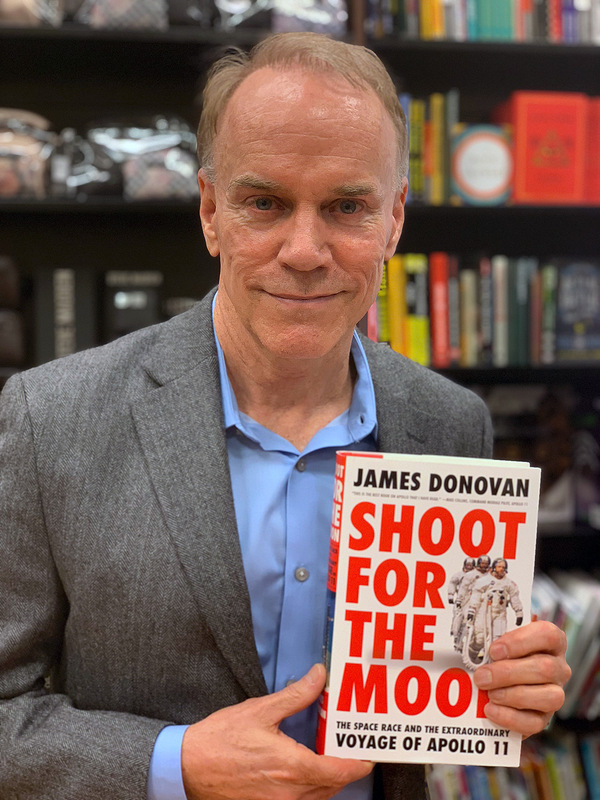 — They say you should not judge a book by its cover, but there is a detail on the front of author James Donovan's latest release, "Shoot for the Moon," that is likely to attract the interest of space history enthusiasts. 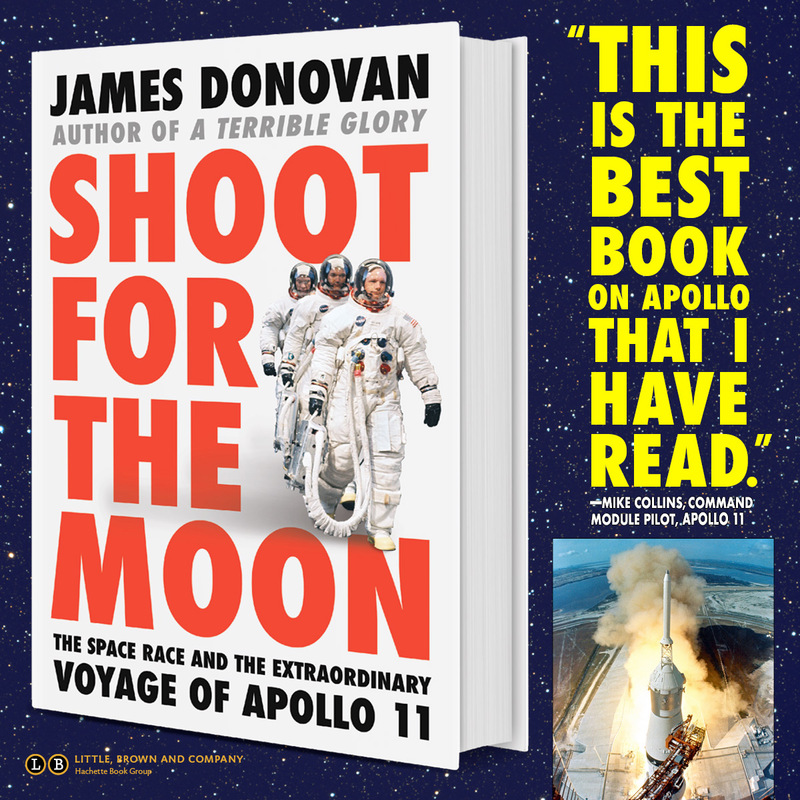 Just under Donovan's byline in small print is, "This is the best book on Apollo that I have read." It is not unusual for endorsements to be included on book covers and this example would otherwise not stand out were it not for who provided it: Apollo 11 command module pilot Michael Collins. 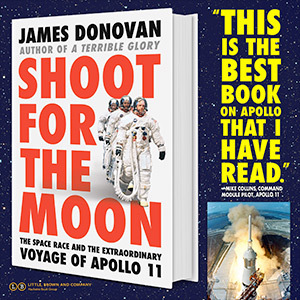 Not only is Collins central to the events that Donovan writes about in "Shoot for the Moon" — the book's subtitle is "The Space Race and the Extraordinary Voyage of Apollo 11" — but Collins' own 1974 title, "Carrying the Fire," is widely considered one of, if not the best of the astronaut-penned memoirs. 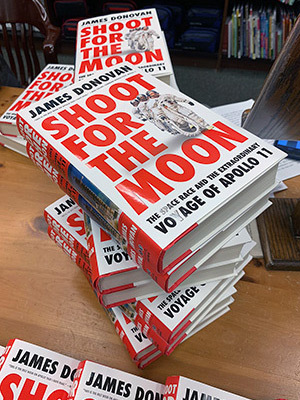 Collins' praise for "Shoot for the Moon" continues on its back: "Extensively researched and meticulously accurate, it successfully traces not only the technical highlights of the program but also the contributions of the extraordinary people who made it possible." 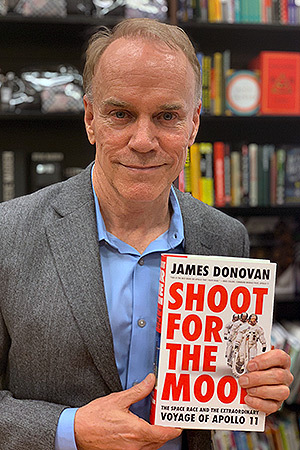 With those words in mind, collectSPACE.com caught up with Donovan to discuss his approach to writing "Shoot for the Moon." 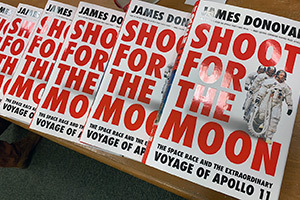 collectSPACE (cS): How did it come to be that Michael Collins singled out "Shoot for the Moon" as the best book about Apollo he has read? James Donovan (JD): Not everybody that sees that quote is aware it's significant. I wrote him a letter and said, "Hey, I'm writing this book. I'd like to do it right. I would love to talk to you, I've got some questions." Two weeks later, I got a phone call from this guy that said he was Michael Collins. At first I thought it was some friend of mine pulling my leg. He was really nice. We talked for about an hour. I called him again at some point and we talked for another hour. And I called him again and we talked even more. We got along and began corresponding by letter. I eventually worked up the nerve about six or seven months ago and and asked if I sent him the manuscript, would he consider giving me a quote that I could use for the book. He said, "I'll do my best." So I sent it to him and then didn't hear back for a while. Of course, as time passed, horrible things were going through my head like, "Mike Collins didn't like my book and he's trying to figure out how to tell me." But we talked and he said, "I liked it. It's very enjoyable. What I really like is that you focused on people behind the scenes who usually don't get talked about." That was one of the aims I wanted to do. Bring out some of the interesting people, kind of like the hidden figures of this story. And he said, "Well, I've got some notes, so let's talk about that." He had gone through my book and made notes about things that he had, well, I don't know if they were concerns, but at least he wanted to comment on. There were about 15 or 20 notes. None of them were major. A lot of them were of the type, "I don't remember saying this. You've got me saying this and I don't remember saying that." And I told him, "Well, I found it. You did say it, you just don't remember saying it." (laughs) Anyway, I made some changes that I thought were warranted given what he said. About three days later, I received one of his personal cards, like an index card with his name printed on one end, and on it, he had written what is now on the cover of the book. If nobody else said one word about my book, that one reply would validate what I did for me. Because he was there. He was on the mission that I am focusing on and that means more to me than what anybody else in the entire world could say. cS: So to back up a bit, how did you come to write a book about Apollo 11? JD: My previous two books were on the battles at Little Bighorn and the Alamo. I was looking for another subject when an editor I know in New York suggested I write something about the space race. I initially dismissed that idea because I thought there were a ton of books already out there. But I loved everything about the space program when I was a kid and the suggestion kept popping back into the forefront of my brain. So I started to look for what was out there on Apollo 11. And there are books on the mission, but I didn't see the one I would want to read, the one focused on the human side of the story. So I thought there was an opportunity to write something that hadn't been written before. cS: Are there similarities between the events at Little Bighorn and the Alamo and what you wrote about the Cold War race to the moon? JD: They are very different events. Well, maybe there is one similarity. I don't know if this counts, but the editor in New York, the same one who gave me the idea for the book, he said to me, "Oh, you know this fits in with the theme of your other books." And I said, "What?" And he said, "Yeah. Men on the frontier." And if you think about it, I guess he's right. But that's about as close as I can get. cS: And that brings us back to Michael Collins — because unlike your prior books, for "Shoot for the Moon" you could talk to people who were actually there. JD: At Little Bighorn and at the Alamo, there's a mystery about what ultimately happened because at both places one side was pretty much totally wiped out, or at least a large part of the contingent were killed. So for years I've been telling people, "I just wish that I wish there was somebody I could talk to that could clear all this up. The next book I do, I want to talk to a subject where some people are still alive who I can talk to about it." And ironically, even with something like the space race that happened well into the 20th century and that was one of the most recorded and reported events in history, there are still details where the firsthand accounts disagree. Because as historians know, people see things differently, even about the same event. 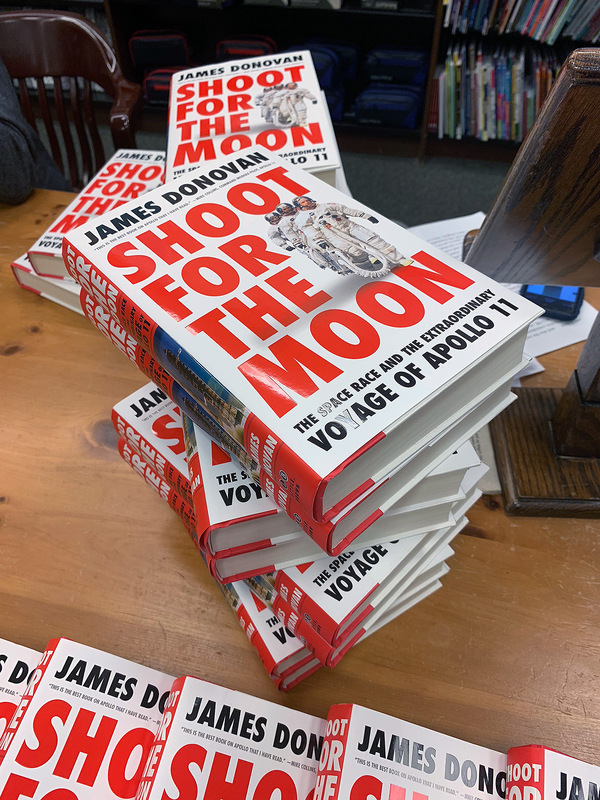 "Shoot for the Moon: The Space Race and the Extraordinary Voyage of Apollo 11" by James Donovan was published by Little, Brown and Co. on March 12, 2019.